In typical applications, these Dwyer switch/gages control between high and low pressure set points. When pressure changes, reaching either set point pressure, the infrared light to the limiting phototransistor is cut off by the helix-driven light shutter. The resulting phototransistor signal is electronically amplified to actuate its DPDT slave relay and switching occurs. Dead band between make and break is 1% of full scale or less - just enough to assure positive, chatter-free operation. A plastic housing protects all electronic components. Solid-state and integrated circuit electronics are on glass-epoxy printed circuit boards and self-extinguishing terminal boards (for the Series A3000 only). In both series of pressure switch/gages, you get the convenience of a visual indication plus high-low limit switching. For both OEM and in-plant applications, the Photohelic® switch/gage is used to control pressures in air conditioning systems, clean rooms, fluidic and pneumatic control systems, materials handling equipment, alarm or control fume exhaust systems, control pressure in air structures, and monitor respiratory and blood pressures. Accuracy: ±2% of full scale at 70°F (21.1°C). ±3% on -0 and ±4% on -00 models. Pressure Limits: -20" Hg. to 25 psig (-0.677 to 1.72 bar). MP option; 35 psig (2.41 bar), HP option; 80 psig (5.52 bar). 36003S – 36010S; 150 psig (10.34 bar). 36020S and higher; 1.2 x full scale pressure. Temperature Limits: 20 to 120°F. (-6.67 to 48.9°C) Low temperature option available. Size: 4" (101.6 mm) dial face, 5" (127 mm) O.D. x 8-1/4" (209.55 mm). Switch Type: Each setpoint has 2 Form C relays (DPDT). Repeatability: ±1% of full scale. Power Requirements: 120 VAC, 50/60 Hz (standard); 240 VAC & 24 VAC Power optional. Set Point Adjustment: Adjustable knobs on face. 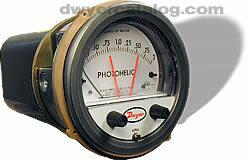 Dwyer Photohelic switch/gages can be wired for high-latching, low-latching or combination high-low latching circuits. That is, the equipment will hold in these respective positions once activated and until manually reset. This can be particularly useful for alarm and signal applications where control is accomplished by another Photohelic® switch/gage or other means. Complete wiring and operational instructions are included. Where manual reset is required a dry circuit push button such as Dwyer Part A-601 should be used. -SR Single contact, right set point, for actuation on increasing or decreasing pressure. -OEM OEM Model, less relay and transformer components and housing but including infared diodes and phototransistor(s), light shutter and set pointer(s). For single or double contact. -RMR Remote-Mounted Relay, relay pack may be mounted remotely from gage. Standard length is 5 ft. For other lengths, specify cable length required. -TAMP Tamper-proof knobs, low temperature option, special scales, voltages and other features and modifications are available. Special Housings available include Weatherproof (NEMA 4) and Explosion-proof (NEMA 7 & 9; NEC Cl I, Gr C&D; Cl II, Gr E, F&G; Cl III). Contact Customer Service for detailed dimension drawings. Bezel and front cover (with set point knobs and zero adjustment screw) removed to expose Photohelic® set point mechanism.Cover is clear polycarbonate plastic. Light shield effectively protects phototransistors from strong outside light sources yet allows free pointer movement. It also gives interior a clean "finished" look. Optical limit switches are used for reliability and long service life. Attached directly to set pointers, they are individually aligned to assure precise switching accuracy. Semi-Flexible drive shaft connects to set point knobs. Zero adjustment screw connects to screw in cover to adjust zero pressure reading. Plastic enclosure protects electronic components and electrical connections. Polycarbonate connection or terminal board is self-extinguishing (A3000 only). Glass epoxy printed circuit boards for durability and permanence. Load relays are DPDT with latching feature for maximum application versatility. Electronics are designed to operate on 50/60 Hz, 120 volt current with 10% over or under voltage. Special units for other voltages are available. Switch set pointers show switch settings at all times. Spring loaded friction clutch prevents operator damage of set point mechanism. Model Number Range - Inches w.c. Inches of w.c. - Zero Center cm of w.c.
Model Number Range - cm w.c.
Model Number Range - mm w.c.